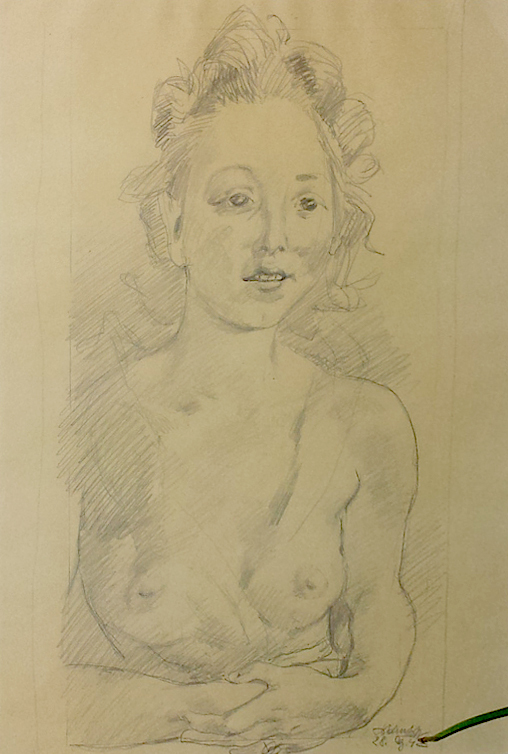 lead pencil on paper, signed and dated. Alexander von Soldenhoff was born in Carouge, Switzerland in 1882. After studying at the school of applied Arts and Crafts in Zurich, he joined the studio of the painter Rudolf Koller for several years who became his mentor later on. In 1904 Soldenhoff continued his artistic studies during stays in Paris. After returning, he became an art teacher in Glarus, Switzerland and got married. Soldenhoff participated in the „Schweizer Ausstellung“ of the Art Society of Frankfurt. From then on, he stayed half a year in Linthal, Switzerland and half a year in Frankfurt, Germany. He kept a studio close to the Opera where he worked as scene painter. Together with the painter Alfred Schnaars, he had several presentations at the „Kunstsalon Ludwig Schames“. In the 1920ies Soldenhoff concentrated on the development and construction of airplanes. He is credited as the developer of a variation of the flying wing he promoted as „The Flying Machine for everybody”. As his efforts failed, he returned to Switzerland. He now focused on his career as painter. In 1935 the first monograph was published by the art dealer Rudolf Hoesli. Ten years later, he split from his wife and moved to Ascona with his Girlfriend. Alexander von Soldenhoff died in 1951 in Zurich.